Are You Ready for Pringles Tortillas? 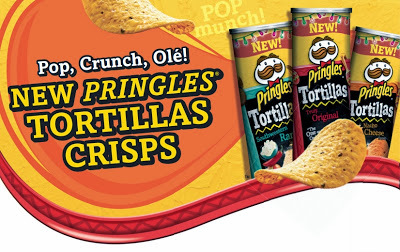 Only one day after I discovered -in horror- the existence of the Frito-stuffed Chicken Enchilada Melt, I learned that Pringles is quietly introducing a a new line of chips called Pringles Tortillas. In case you’re wondering, (I’m sure you are) the Pringles tortilla chips come in three flavors: Truly Original, Nacho Cheese, and Southwestern Ranch. You might also want to know (I do) that Walmart also carries “Zesty Salsa” as an exclusive flavor. This entry was posted in Food, Marketing & Advertising and tagged Hispanic food, Pringles, tortillas, Walmart. Bookmark the permalink.